In Sun Stand Still, Pastor Steven Furtick challenged us to ask God for the impossible&mdash;to live, every day, with the same faith in the miraculous that we see in the Bible. In this daily, personal guide Steven leads you deeper into Scripture as you begin to live the life God created and saved us for. Over the next forty days, you&rsquo;ll have the opportunity to see what audacious faith can look like in your own life. Through daily scripture readings and teachings, this book will give you the chance to change your perspective on prayer. If you have the ability to ask, God has the ability to act - and transform the ordinary into the extraordinary. 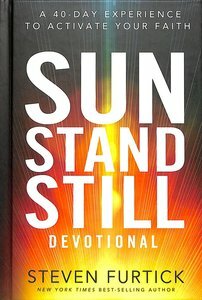 About "Sun Stand Still Devotional"
Pastor Steven grew up in Moncks Corner, South Carolina, where at age 16 he realized God's plan for him to start a life-changing church in a metropolitan city. This vision became a tangible reality when Elevation was founded on the faith of eight families who risked everything. Selling their houses and quitting their jobs, they moved to Charlotte believing that God would turn this city upside down for His glory through the local church. After nearly five years, Elevation Church has grown to more than 8,000 in attendance each week at four locations. Since our launch, we've seen more than 10,900 people receive Christ. In 2007, 2008 and 2009, Elevation Church was named one of the "10 fastest growing churches in America" by Outreach Magazine. The heart of Pastor Steven's message is audacious faith and how to approach every experience from a visionary perspective. As a young voice in the Church with wisdom beyond his years, his passion for seeing God's purposes fulfilled is igniting a fire here in our city and beyond. Pastor Steven attended North Greenville University, received a B.A. in communications and went on to complete a Master of Divinity from Southern Baptist Theological Seminary. He resides in the Charlotte area with his wife, Holly, and two sons, Elijah and Graham. till the nation avenged itself on its enemies. Right here on Day 1, I&rsquo;m going to throw out a challenge to you: If you&rsquo;re not daring to believe God for the impossible, you&rsquo;re sleeping through some of the best parts of your Christian life. And further still, if the size of your vision for your life isn&rsquo;t intimidating to you, there&rsquo;s a good chance it&rsquo;s insulting to God. You should be living by audacious faith every day. Audacity is not just for &ldquo;elite Christians.&rdquo; It&rsquo;s intended for every believer. So today we&rsquo;re beginning a spiritual&#160; journey toward trusting God for what seems impossible. I&rsquo;m thrilled to think about what it&rsquo;s going to do for our lives and our world. A story from the life of Joshua serves as our template for audacious faith. The Israelites unleash a surprise attack on the Amorites, and right from the beginning the battle goes well. But as the sun sinks toward the horizon, General Joshua faces a decision. The victory isn&rsquo;t complete, and once it gets dark, the rest of the Amorites will slip away. Joshua sizes up the situation and delivers one of the most gloriously unorthodox prayers in the Bible. He has the audacity to ask God to make the sun stop in the sky. To freeze time on behalf of His people. And God gives Joshua exactly what he asked for. With everything in me, I believe God still desires to make the sun stand still over the life of every believer. Obviously, not in the unique way He did for Joshua, but in ways that are equally spectacular (although not always quite as dramatic), God is perfectly willing to perform the impossible in our everyday lives. If we have the audacity to ask. RT God is ready to act if we will be bold enough to ask, not just for a good day or a better life, but for the impossible. I tried this one time. My wife and I moved to Charlotte, North Carolina, with seven other families. We set a goal of reaching over one thousand people in our first year of ministry. Since the average church size in America is fewer than ninety, I guess we were overshooting a bit. But we wanted to see God accomplish something so exponentially amazing that it would leave no doubt who deserved the credit. So we shamelessly asked God to exceed our wildest dreams. The story of our church is still being written. But here&rsquo;s what I can tell you now. After seven years of ministry, our church has grown to more than twelve thousand people in regular attendance. Since our opening day, thousands of people have publicly professed faith in Christ. Sometimes when we consider the rate at which God has multiplied this ministry, we feel like we&rsquo;re living in a warp-speed dream world. But the story is real. We are living in the middle of a move of God. Is there something that is seemingly impossible that you&rsquo;d like to see God do through you? Maybe God has already been working in your spirit, planting a desire, sparking ideas about the much bigger things He wants to accomplish. There&rsquo;s nothing our world needs more desperately today&mdash;in individuals, families, businesses, churches, and communities&mdash;than God&rsquo;s saving, supernatural acts. And God is ready to act if we will be bold enough to ask, not just for a good day or a better life, but for the impossible and then will step forward to act in audacious faith. prayer focus: Over the next forty days, pray for God to build audacious faith within you and to show you where He wants you to apply it.